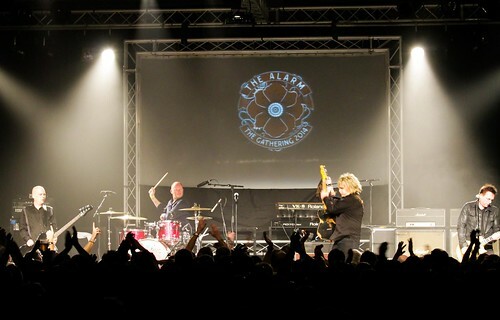 Mike Peters and The Alarm delivered an electrifying weekend of music at The Gathering 22 which was sold out to capacity (1300) and celebrating a return to LLandudno after a four year hiatus in Prestatyn. 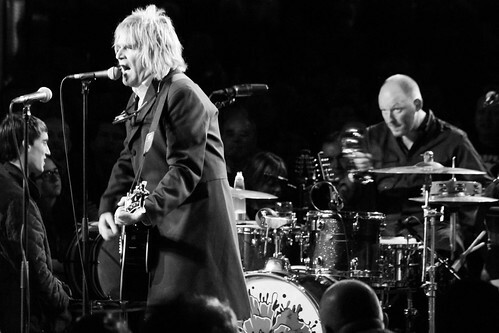 The Gathering began early on Friday night and featured a 2:45 hour set by Mike Peters that began with a debut of the soon to be released ‘Declaration 2014’ album. 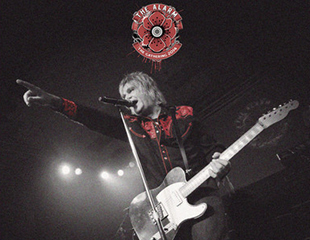 Mike Peters was joined by world class drummer and multi-instrumentalist Smiley (who has played with both Robbie Williams and Joe Strummer), and the two took the sound of The Alarm back to its original folk acoustic punk roots with a banging set of early Alarm classics that had the audience enraptured by the new modern vintage sound that left fans filled with excitement about the prospects for the new release and upcoming ‘Declaration Tour’ which is on the verge of being a complete sell out. For the finale the two were augmented by the full Alarm 5 piece line up, James Stevenson (The Cult), Craig Adams (The Mission), and Mark Taylor (Simple Minds), for a closing ‘Sixty Eight Guns’, performed for the 21st Century in a style that no one anticipated. 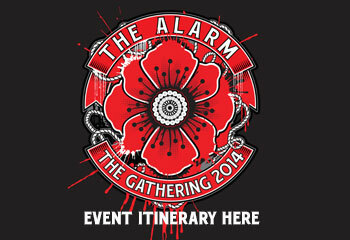 It was like the White Stripes, Bob Dylan and The Clash all thrown into one stupendous mix called The Alarm 2014. 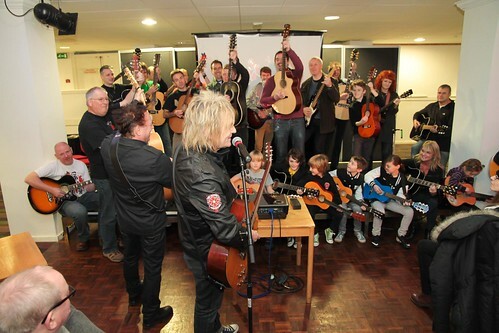 There was still more to come as Mike Peters made an emotional dedication to the doctors and nurses of the Alaw Unit, Ysbyty Gwynedd and the North Wales Cancer Treatment Centre in Glan Clwyd hospital and principally Dr. David Edwards. 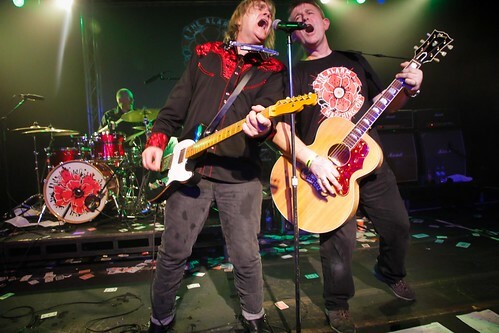 Dr. Edwards who is the Haematologist responsible for keeping Mike Peters alive through 18 years since he was first diagnosed with Non Hodgkins Lymphoma and again with Leukaemia in 2005. 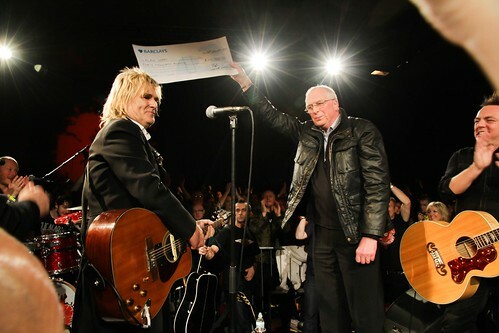 As a show of appreciation Mike invited Dr. Edwards on to the stage where he was presented with a cheque for £40,000 to help with improvements to the cancer facilities in North Wales. 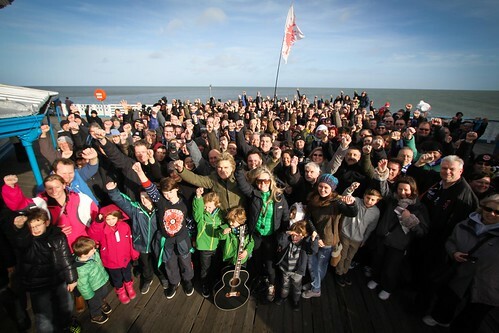 All the funds were donated and raised through the Love Hope Strength Foundation (formed by Mike Peters and his wife Jules in 2007) as the catalyst for the annual Snowdon Rocks event which is populated by local supporters and Alarm fans who follow Mike to the top for an acoustic concert on the summit once a year. Mike was also able to break the news that the Love Hope Strength ‘Get On The List’ campaign, which can successfully sign people on to the registry up the increased age of 55, has found its first lifesaving match, with an as yet unnamed person (who signed up in late 2013), already in London being prepared to help save a persons life. Mike took the opportunity to thank local MP’s Chris Ruane (Denbighshire), and Mark Tami (Deeside), for their support in helping make this change to the age restrictions a reality for the UK. In America the Love Hope Strength Foundation, which has been signing up people from 18-55 for that last few years has registered over 58,000 people and found close to 800 potentially life saving matches.